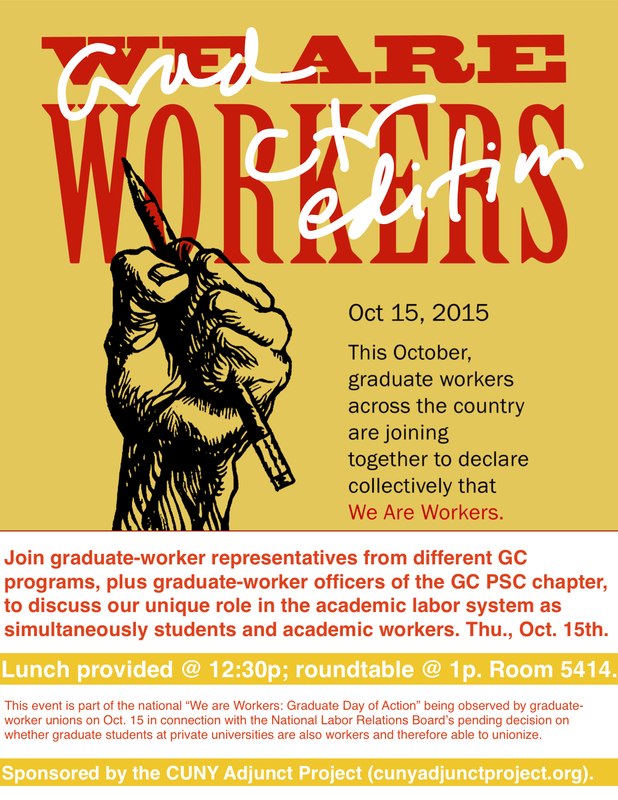 We Are Workers: Graduate Worker Day of Action—GC Edition! 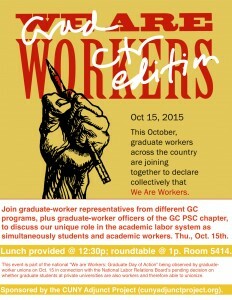 Join the CUNY Adjunct Project, graduate workers from different GC programs, and graduate-worker officers of the GC PSC chapter, to discuss our unique role in the academic-labor system as simultaneously students and academic workers. Thursday, October 15, room 5414. Lunch provided at 12:30p; roundtable discussion at 1p. This event is part of the national “We Are Workers: Graduate Day of Action” being observed by graduate-worker unions on Oct. 15 in connection with the National Labor Relations Board’s pending decision on whether graduate students at private universities are also workers and therefore able to unionize. Please see our joint statement here.